On January 13, 2006, after a little more than eight years of hard work, Apple Inc. passed Dell, Inc. in market value, $72.13 billion vs. $71.97 billion at market close, respectively. • 2X: On July 27, 2007, Apple’s value doubled that of Dell’s, $127.81 billion vs. $63.65 billion, respectively. • 3X: On December 6, 2007, Apple’s market value passed 3 times that of Dell’s, $165.66 billion vs. $54.42 billion, respectively. 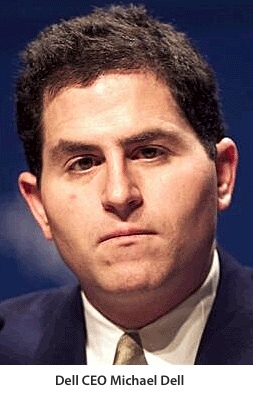 • 4X: On May 01, 2008, Apple’s market value quadrupled that of Dell’s, $158.66 billion vs. $38.97 billion, respectively. • 5X: On February 12, 2009, Apple rose $2.60 to hit a market value of $88.37 billion or 5 times that of Dell’s $17.52 billion. • 6X: On October 20, 2009, Apple rose $11.21 to $201.07 to hit a market value of $180.12 billion or more than 6 times that of Dell’s $29.97 billion. • 7X: On January 26, 2010, Apple gained $7.57 to $210.64 to hit a market value of $189.72 billion or more than 7 times that of Dell’s current $27.03 billion. • 8X: On May 21, 2010, Apple gained $1.95 to $239.74 to hit a market value of $218.12 billion or more than 8 times that of Dell’s current $25.84 billion. • 9X: On June 1, 2010, Apple gained $6.89 to $263.77 to hit a market value of $240.01 billion or more than 9 times that of Dell’s current $26.29 billion. • 10X: On September 9, 2010, Apple gained $1.60 to $265.37 to hit a market value of $242.43 billion or more than 10 times that of Dell’s current $24.21 billion. • 11X: On September 23, 2010, Apple rose $3.79, or 1.32%, to $291.54 to hit a market value of $266.34 billion or more than 11 times that of Dell’s current $23.81 billion. • 12X: On January 27, 2011, Apple rose $0.26, or 0.08%, to $344.11 to hit a market value of $317.02 billion or more than 12 times that of Dell’s current $26.02 billion. • 13X: On August 26, 2011, Apple rose $9.86, or 2.64%, to $383.58 to hit a market value of $355.61 billion or more than 13 times that of Dell’s current $27.29 billion. • 14X: On September 20, 2011, Apple rose $1.82, or 0.44%, to $413.45 to hit a market value of $383.31 billion or more than 14 times that of Dell’s current $27.15 billion. • 15X: On February 15, 2012, Apple rose $14.03, or 2.75%, to $523.49 to hit a market value of $486.78 billion or more than 15 times that of Dell’s current $32.37 billion. • 16X: On february 29, 2012, Apple rose $8.43, or 1.575%, to $543.84 to hit a market value of $505.75 billion or more than 16 times that of Dell’s current $31.35 billion. • 17X: On March 12, 2012, Apple rose $3.27, or 0.60%, to $548.44 to hit a market value of $512.33 billion or more than 17 times that of Dell’s current $29.94 billion. • 18X: On March 19, 2012, Apple rose $9.94, or 1.70%, to $595.51 to hit a market value of $553.29 billion or more than 18 times that of Dell’s current $30.61 billion. • 19X: On March 26, 2012, Apple rose $10.93, or 1.83%, to $606.98 to hit a market value of $565.93 billion or more than 19 times that of Dell’s current $29.43 billion. • 20X: Today, April 3, 2012, Apple rose $10.49, or 1.70%, to $629.12 to hit a market value of $585.93 billion or more than 20 times that of Dell’s current $29.21 billion. Apple is also a debt-free company and currently has well over three times in cash on-hand (now over $100 billion) than Dell Inc. is worth. See AAPL and DELL quotes via NASDAQ here. Twenty. 20. TWENTY!! Holy crap. Is it just me being old (and remembering 1997 very well), or does this somehow seem surreal? five DELLs since Feb 15, that makes a rate of about 0.1 DELLs a day for AAPL. This has become a weekly ritual. Is twice in one day possible? Whatever happened to the Dell Dude? Did he get a Mac or something? Maybe he knocked up Ellen Feiss and had a batch of slacker kids. Oh Man, that is really really funny. Remember? That guy got busted for pot. As if computer users everywhere would be offended by a guy who smokes it. Personally, I think that was the beginning of the end for Dell because they were getting traction with that guy, but then they treated him like Michael Phelps. The story that just never gets old. It will be a sad day when Dell shuts its doors and these updates come to an end. Dell didnt want to help? Why should they have? Why help out a competitor? How exactly could have Dell helped? Apple is strong and bigger than Dell exactly because Dell did not help them. They used their own talents and abilities to correct the serious internal problems that nearly brought Apple down. To suggest that Dell should have helped out Apple is ludicrous. 1. A competitor doesn’t always necessarily make you an enemy. You can learn from your competitor. A competitor is in the same industry as you and can inspire, motivate and/or galvanize your team. Dell, HP, Sony and many other hardware companies have always tried to copy (or learn from) Apple’s model, product line, etc. Look at the iPad (tablet market) Its been around for the past 10 years and they all got it wrong until Apple created the iPad and now every tablet looks EXACTLY like the iPad. The other manufactures are now selling tablets (not as many as Apple) They learned how to build them correctly from their competitor – in other words, Apple helped out its competitor. Dell was a beast in the industry in 1997 and could have somehow found a way to help Apple and benefit themselves, 15 years ago. 2. Microsoft was in the same shoes as Dell during that time -1997. Riding the wave of success from selling cheap Windows machines. Microsoft – A COMPETITOR, A COMPETITOR, A *&$@% COMPETITOR, made an investment in Apple through a brilliant proposal from the late, great Mr. Steve Jobs. Microsoft was a competitor the same as Dell- one sold software the other sold hardware. Because of Apple’s incredible turnaround and long-term success Microsoft won – they sold software to mac users and their investment of Apple stock grew. – Dell could have helped Apple and themselves the same way Microsoft did. 3. Dell doesn’t innovate sh*t, they copy and duplicate. Thats why they are not as successful as Apple. Apple innovates. Period. While on top of the PC world, Dell should have done exactly what HP did in 2004. Licensed Apple hardware (I know, Apple rarely does this). At the time it made total sense. Hp didn’t have to innovate, nor did Dell. License and sell a boat load of them. HP’s iPod accounted for 5% of total iPod sales at one time. Dell should have helped because Dell could have benefitted financially. 4. Dell and Apple were both heavily invested and focused in the same market in 1997- Education. At the time Apple had 3 opportunities that Dell could have capitalized upon through investment and innovation. A. The eMate (a newton laptop) sold to schools and educational institutions. B. A PC Card that could have went into the Mac PowerPC boxes allowing Dell market share to grow and Mac users to have both a Mac and a Dell in one box. Orange PC did this and it was hurt due to marketing and low distribution. C. The Clones (Radius, Power Computing, Motorola, Daystar and Umax). Apple discontinued them because they competed against Apple instead of venturing into new markets so Apple could gain market share. Dell was in a unique position and could have made boxes that had more than one operating system option for the education market. Dell could have invested into being a Mac clone and might have been successful if they focused on a niche Apple was not pursuing. Again, don’t call something you dont understand ludicrous. Geez, should be 21 times by tomorrow afternoon at this pace. I do about one Dell a day. Then I wipe and flush.